A day after Barack Obama was inaugurated as the 44th president of the United States in a historically massive (and massively historic) Washington celebration, the big debate wasn&apos;t about Rick Warren&apos;s address or the best one-liners from Obama. It was this: How many people actually went to this thing? The question is an intensely personal one for the people who attended ("I was one of 2 million" sounds better than "I was one of 700,000 or so") as well as an essential historical footnote for future accounts of the day. In many ways, though, the politics of crowd-counting are messier than those "politics of yesterday" Obama always talks about -- even as crowd-counting strategies grow more sophisticated, satellite photos, mathematical logarithms and all. According to images, swarms of people were tightly packed all along the 2-mile stretch of the mall, and other hard figures exist in the 240,000 people who were issued tickets, and the record 1.1 million people who rode the metro in Washington on Tuesday. The Washington Post devoted two-thirds of a page in its Wednesday edition to explaining how it used an aerial photo to come up with its estimate: about 1 million. The Post&apos;s database editor sliced up a satellite image of the National Mall, estimated that reasonable people take up about 4.5 square feet per person (less reasonable ones 2.5 square feet) and then factored in the apparent density of each zone. An Arizona State journalism professor, using a similar calculation - and an image shot from 423 miles overhead -- settled on 800,000 people. The Associated Press hedged its bets with "more than 1 million," while Washington mayor Adrian Fenty and security officials went with "roughly" 1.8 million. Somewhere in between lies the 1.2 million who supposedly attended Lyndon Johnson&apos;s inauguration in 1965, and who set the bar for what we think is the highest inauguration attendance in recorded history. Tuesday&apos;s attendance clearly matters for the superlative - this had to have been the largest crowd ever, right? That little piece of trivia will be an important part of the history-book narrative (both of the literal event itself and the broader meaning we attach to the start of a new era). The view Tuesday, both from the ground and overhead, seemed to support that idea. But as veteran crowd estimator and University of Illinois professor emeritus Clark McPhail told the Los Angeles Times, "A million rolls off the tongue very easily, but most people have no idea what it really looks like." Crowd-counting as an exercise is typically more controversial when the crowd being counted consists of protesters and not hopemongers. Police, politicians and organizers have regularly sparred over estimates at anti-war rallies, where the number that winds up in the next day&apos;s paper is often more effective spin than the images that accompany it. A Fox News photo caption online Tuesday, for the record, did refer to a meager "tens of thousands of people." The National Park Service has tried for the last decade to stay out of such debates after official estimates at the Million Man March amounted to considerably fewer than the namesake one million people. Congress, in fact, ordered the Park Service after that 1995 controversy to stop issuing crowd counts. The NPS has hinted that it may get back in the game later this week due to the historic nature of Tuesday&apos;s gathering and what feels like a historic need for a number. After all, in the absence of consensus, someone has to deliver the final word. "None of us here want to go through the next 20 years saying LBJ was the biggest we&apos;ve ever had if that&apos;s not true," a park official told USA Today. Body counts matter whether it comes to generating headlines or political activity, so efforts to gain usable numbers are a matter of some concern. The administration's imperfect tally of stimulus-created jobs sculpts new vistas for the punditocracy to survey. For years Americans having been moving long distances less and less, but the current bad times are pushing the percentages to post-World War II lows. UPDATED: President-elect reportedly selects physicist John Holdren as his consigliere on science. It’s "soda, soda everywhere and not a vitamin in sight" across swaths of America identified in the USDA’s new online "food desert locator map." 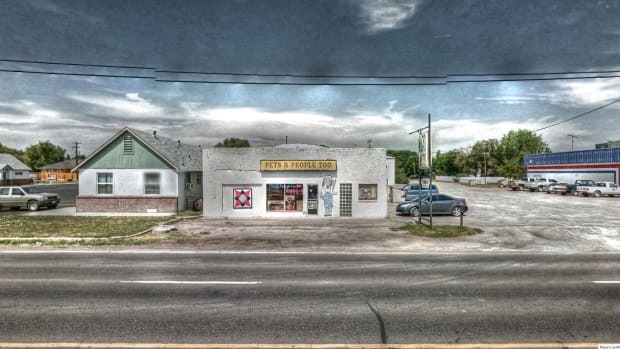 What Google Street View images tell us about our neighborhoods—and ourselves.